This for me is my go to products whenever I feel like I need to change up my routine . I have combination skin and uneven skin tone . I cant say that it does anything to change my uneven skin however it does make an excellent cleansing system and my skin is always left feeling clean and refreshed . I prefer the cleansing bar as I feel like it cleans my face better , with the liquid soap i just feel like its a surface clean as opposed to actually removing any left over make up or dirt particles from my face. The toner is a bit strong but I love it because it really works for me and tones my skin leaving it feeling refreshed . I prefer the dramatically different moisturizing gel instead of the lotion as due to my combination skin the lotion tends to make my face very oily throughout the day . The gel however is just right and absorbs quickly and keeps my skin feeling moisturized all day long . Its always nice to ask the rep for the samples as it helps you find out exactly which product works for you and which products dont . I tried Clinique after trying everything else on my skin. I have dry/flaky skin since I was a teen.My friend and I both grabbed a bag. She has combination skin with breakout now and then, but she says it did nothing drastic for her. However for me it changed everything! I gave up finding a skimcare regime that would help with my skin. I bought the Clinique pack but wasn't convinced that it would be effective since it is such a simple routine. I can proudly say that my skin isn't flaky anymore, still dry but not flaky. The liquid soap is fantastic, not drying at all. I also have the cleansing bar soap, which comes in a beautiful soapholder. The soap is good and effective but I still wipe my face with a cloth afterwards since I kinda feel sticky! The moisturisung lotion is amazing! It feels like melted butter on your skin! I also like the clarifying lotion, it is not harsh on my skin and I actually feel that it does something compared to other toners. This range is affordable considering how long the products last! I already have a backup stash. I will try other products but I have a feeling that I will keep on returning to these! This 3-Step cleansing system is highly effective when all the products are used together, as recommended. However, it is important to wait a while before results are visible. To some, like myself, visible results were not so dramatic as my skin suffers from fewer problems. After several weeks, I noticed that it does effectively clear up blemishes, reduce pore size, improve the tone and texture of the skin, and most importantly the ability for other products - treatment and makeup - to "sink well"l into the skin. I do believe that my skin takes on a healthier appearance and behaviour when I use this system. The one problem with this system is the performance of the Clarifying Lotion - it is far too heavy, strong, and "chemically". I can feel my eyes burning when I use it. A girl I know even compared it to nail varnish remover, and I couldn't agree with her more. After switching to a milder toner, I felt more comfortable using the other 2 products. Don't expect to see incredible results, because this system works vigorously from within the skin. t’s hard to find the right skin care system out there especially with the vast number of beauty brands and products available on the market. 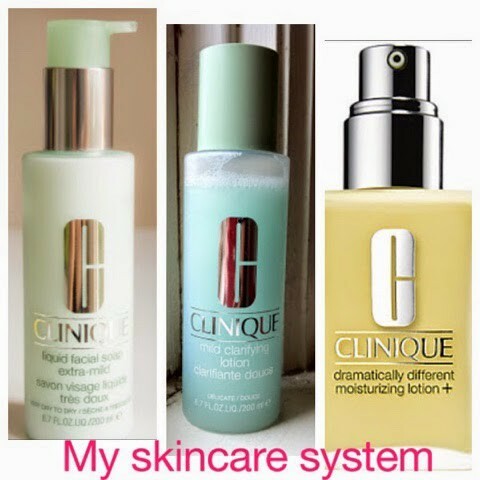 I had the pleasure of trying the Clinique 3 step skin care system. Now this review is based on my skin type. I have dry to combination skin and sensitive on top of everything else. It was hard for my to find the perfect system. So I would normal pick a facial wash from one brand, toner from another and a moisturizer from elsewhere. This all because of the problems with my skin, so I would wear make-up on a daily basis just to cover up my skin problems and not really solve the actual problem. Now that all stopped when I tried this skin care system. Let’s start with step 1- the Extra Mild Facial Wash. If you’ve ever put olive oil on your face or even a step further, butter – then that’s what this facial wash feels like. It totally cleans your face and doesn’t leave your skin feeling tight and dried out. Your skin literally feels like silk after washing. All you do is wash your face with tepid water and then a 2-3 pumps of the soap and you’re all clean. Step 2 is the Mild Clarifying Lotion, this clarifying lotion removes all the excess dirt from your skin and again it feels like water and oil. It doesn’t strip your skin of its essential oils and you instantly see the glow on your face. All it requires is for you to dampen the cotton wool with the clarifying lotion and simply swipe it over your face. Step 3 is the dramatically different mositurizing lotion. Just pump some and moisturize your face, we all need to moisturize daily. Now I follow this regime twice a day and can I honestly say that I don’t need to cover up with makeup on a daily basis. I now have the confidence to walk around with no makeup (I call it a makeup sabbatical). Ladies go to your nearest Clinique counter and get a skin analysis done so they can determine your skin type and give you the right products for your specific skin needs. Enjoy your healthy looking self. This has been a firm staple in my beauty arsenal for about 5 years now. It leaves the skin clean,fresh, hydrated and blemish free. From the 3 step system the Clarifying lotion is my favourite. Nothing beats Clinique's toners. They really do a great job of getting rid of cleanser residue and tightening the pores. I would highly recommend using this 3 step routine morning and night for a happy skin. I use this product on my face everyday to have the perfect skin I've always wanted. 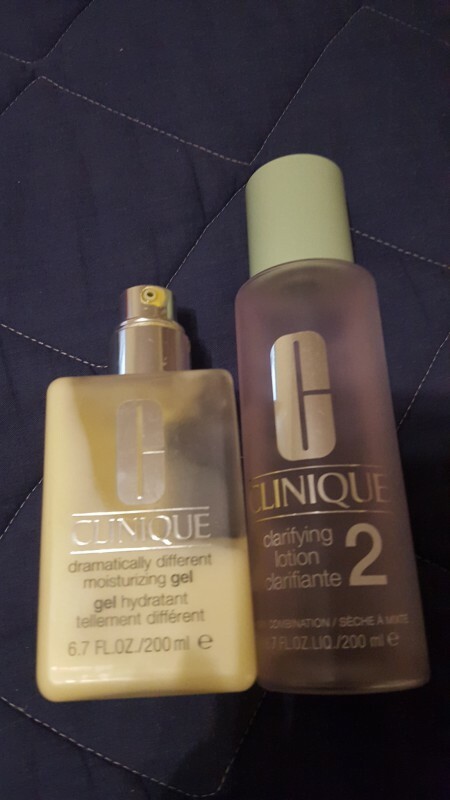 I've been using Clinique for almost five years now and this is the most amazing product ever. I have always struggled with skincare ranges that were just not suited to me skin. And I have tried across the price range from the off the shelf cheaper ranges to the exclusive ranges - they all just didn't work. Until I found clinique, I was convinced I would never have flawless skin. I don't have any problems with my skin and my skin looks beautiful. It also feels beautiful and my dehydration, occasional acne, peeling skin and age spots area thing of the past. I have always had acne and have tried EVERYTHING and then i started to use CLINIQUE 3 STEP RANGE with in two days i sow such a change in my skin, the redness and my acne started to dissapear with every day useage. i couldnt believe that it would work and I have not looked back, It even made my make up look 100% better . Great Quality!A salon quality skincare regime which costs half the price! Cleared my breakouts and left my skin glowy after 3 to 4 weeks of use. The clarifying lotion leaves a tingly sensation behind and the Dramatically different moisturizing lotion is as smooth as silk and leaves the skin feeling that way as well. 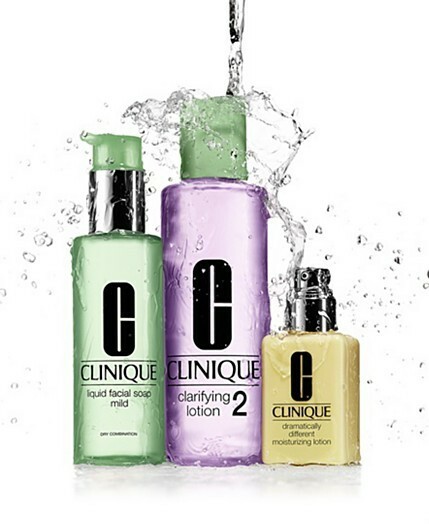 The Clinique 3 step system definately worked for my skin in the beginning, but I found that after a while, it began to lose its effectiveness and started feeling harsh. The Best I have ever used!